One of the great things about not being young is having a raft of experience that has pitched up in some interesting places during momentous occasions, so when a day like today comes along I don’t have only vague notions of pop culture-fed imaginings, but personal recollections that pull me along and surround me in a sea of memories I can touch, smell and taste. I can cast my mind back to the day before today 40 years ago … September 17, 1970 … and conjure that world of long, flowing locks on everyone, Indian bedspread material curtains on widows of VW vans, the fragrance of brown rice bubbling with patchouli and weed undertones wafting just about everywhere, the tingly-tongue-taste about to bloom to bare feet from a dot of blotter. Was there ever another such time? Has history ever gifted such a hopeful youth, one so committed and convinced it perched on the edge of greatness and could easily force feed a future on hope, dreams and hallelujah hallucinations of humanity humbled? There was a war happening and we shook off our parents’ orchestrated baaing and sang back into their faces that we should all give peace a chance instead of playing dominos and watching our friends and brothers fall in organized lines … confident in the fact that if you want to end war and stuff, you gotta sing loud. Yes, it was a sanguine saga, a buoyant, confident and expectant generation, but by definition youth lacks experience and growing up had to happen. 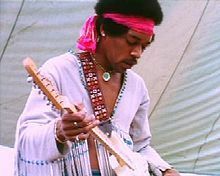 Some of that growing up started today 40 years ago … September 18, 1970 … hence this post, today being the anniversary of the death of one of the best guitarist to ever pluck a string, Jimi Hendrix. Sixteen days later, the world lost Janis. Nine months after that it was Morrison. We had been accustom to death by war, by accident, by disease, but we’d rather missed the specter of death by life … by excess of passion, by a profligacy of youth, by presumption that power manifested assured immortality. We grew up … for sure … grasped impermanence and assimilated the assumption of disillusionment into our core just like every generation before us. We’ve shifted gears and goals, darkened the rose tint on our shades, and some have developed a conservative shell to fend off what they once may have embraced. the music lives, and will outlive us.